I must admit I consider myself to be a bit of a risotto master. 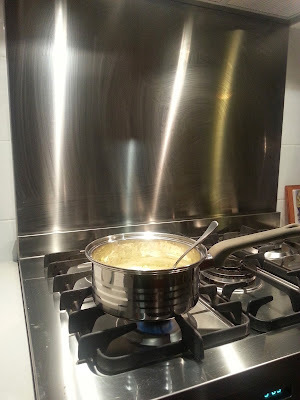 Even when I had no confidence in the kitchen, risotto was the one thing I actually knew how to cook. Now it is a staple in our home. The kids love it and you can make it with as many or as few ingredients as you like. My standard is mushroom but sometimes they talk me into adding bacon or I use fancy Japanese mushrooms. And I'm a stirrer. I'm firmly in the 'stand at the stove and stir for 30 minutes' camp. I find it therapeutic. When I was offered the chance to taste and review Pitango Risotto I jumped at at the chance. Would it be as good as mine? Would the family like it better than mine?? And what would I choose to serve with it? I chose to sample the Organic Chicken and Garlic Risotto and cooked a warm kale and pinenut salad with it. Accompanied of course by a glass of Sav Blanc! I was honestly very pleasantly surprised. I would consider this to be a convenience food, a step up from takeaway but not quite homemade. At $8 for 2 serves it is much cheaper than takeaway and healthier. And if you aren't into standing by the stove stirring for half an hour - much easier than homemade. I tend to be wary of pre made foods because of the added 'stuff' you get. But as you can see from the ingredients .... what you see is what you get. 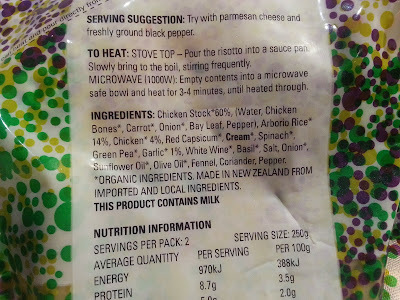 Standard risotto ingredients. 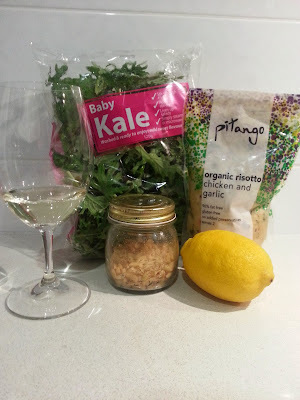 Served with my warm kale and pine nut salad it was an easy mid week meal. Even for a harsh risotto critic like me. 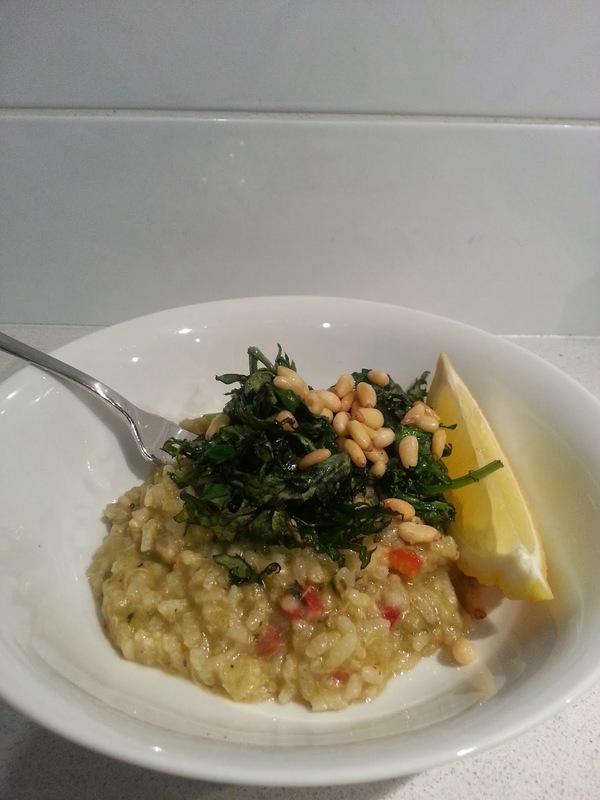 It would be especially handy if you like risotto but can't be bothered making your own. Preheat your oven to 135 degrees C.
Lay your kale in a single layer on a baking sheet and lightly douse with olive oil. Season with salt and pepper. Sprinkle pine nuts over the top and pop the whole lot in the oven for 10 minutes. Kale will come out crispy like chips. If using the baby kale like I did you will get a mix of crispy and wilted. Serve with Pitango Organic Chicken and Garlic Risotto and a wedge of lemon. Thanks to Pitango Risotto for the opportunity. Pitango Risottos and Soups are available at Woolworths. I like risotto but I haven't made it recently cos I'm not a big fan of standing around and stirring. 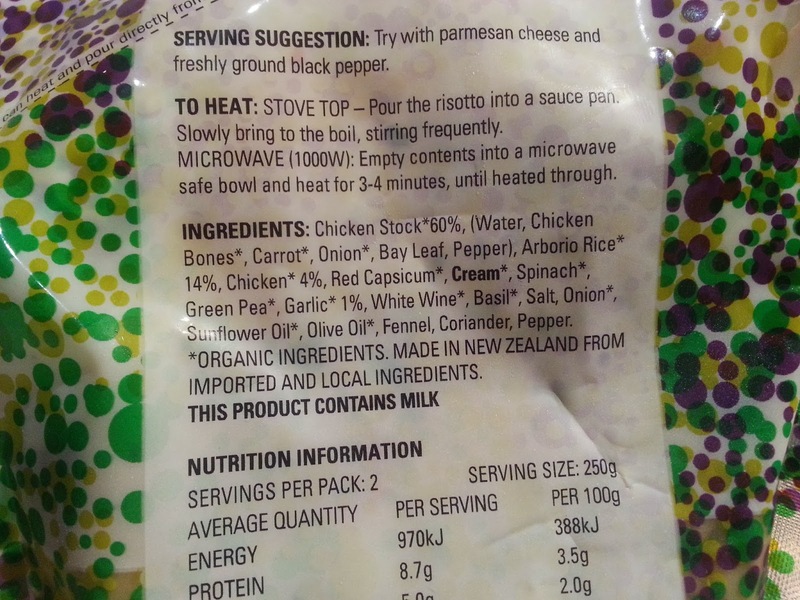 Apparently there's a no-stir risotto method somewhere. My favourite is tomato based as my kids dislike mushrooms. It's good for our fish fridays!